For frequent visitors to sushi bars, you must have probably ordered Philadelphia roll at one certain point in time. This is one of the most common items ordered in sushi restaurants and born in America as it can be found on many menus around the country. Also known as Philly rolls, these interesting rolls can be made at home as they are easy and fun to make and even so much cheaper than at the restaurant. Sushi is a Japanese dish that involves the use of rice and other vegetables where they are all rolled in seaweed and sliced into pieces. The name sushi means “it’s sour” with reference to the whole dish having a sour or savory taste. 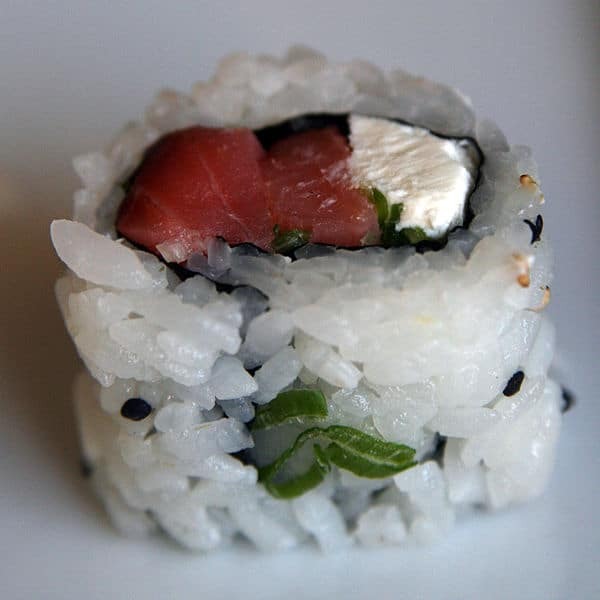 At a time when sushi became popular in North America in the 1980s, lox and cream cheese were incorporated in a sushi roll. This use was taken from the use of the ingredients in bagels. Originally, sushi was fermented fish with rice that has been preserved in salt. It was a staple dish for several years in Japan until the Edo period (1603-1868) when contemporary sushi was developed as traditional sushi took longer to prepare with the series of fermenting steps required. This contemporary sushi is what is now made popular at fast foods and restaurants. There are five main types of sushi, we have the Nigiri which is a topping (fish or shellfish) served on top of sushi rice. 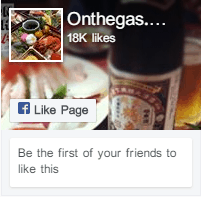 There is shellfish which is just fish or shellfish served alone with no rice. The other three come as either maki with rice and filling where the seaweed is on the outside, uramaki where the rice is on the outside and the second shaped the inside or temaki cone-shaped piece of sushi that has been hand rolled. In the hands of a chef, specialty sushi rolls can be created by combining different types of fish and vegetable. Amongst different popular sushi rolls that exist such as Tiger roll, Crunch roll, Rainbow roll and a host of others, we have the Philly roll. From all said so far, it can be seen that a Philadelphia roll is a makizushi type of sushi (short form, maki) principally made of smoked salmon, cucumber, cream cheese though other ingredients, its like onion, avocado, scallion, and sesame can be included Makizushi is basically a rolled sushi. 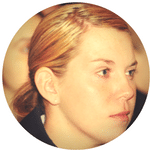 It is formed with the help of a bamboo mat known as makisu to give a cylindrical piece. When it comes to wrapping options, nori (seaweed) isomelety used but soy paper, the omelet or shiso (perilla) leaves can also be used. After preparation, a single roll of makizushi is usually cut so six or eight pieces. Homasakiise thin sushi rolls with just sushi rice and fish on the inside and nori on the outside. 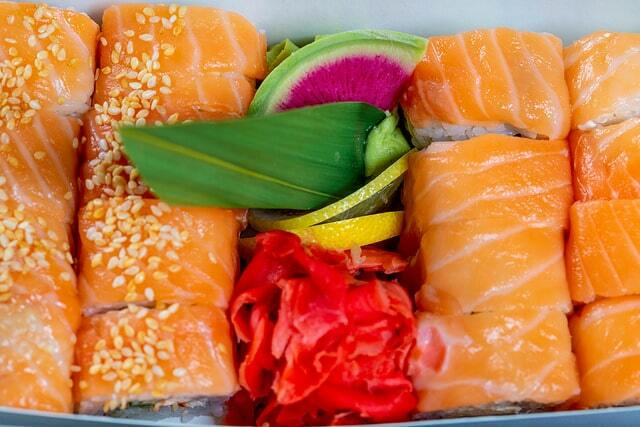 Salmon homosaki from Japan was the inspiration for “Philadelphia rolls” that is now popular. It is often said that the name “Philly roll” is derived from the use of Philadelphia brand cream cheese in the recipe. 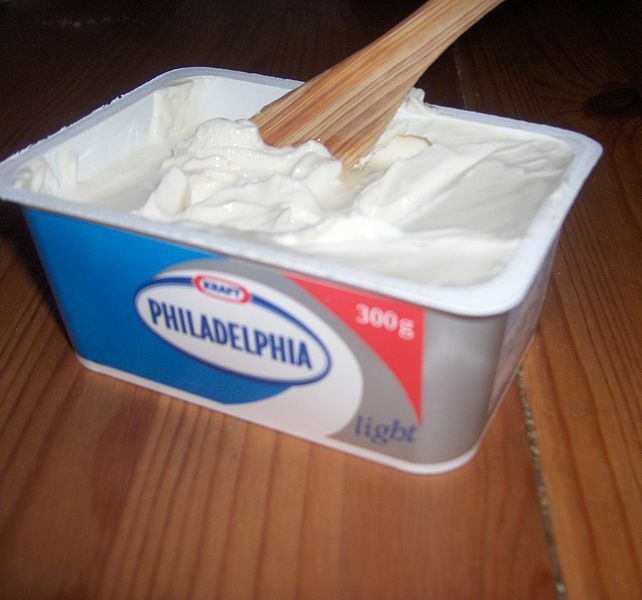 I’m sure this has given you a great tip when it comes to making use of cream cheese. I bet no other brand would give your rolls a taste like the ones made with Philadelphia cream cheese. Japanese cuisine with an a great combination of flavors, it is the desired breakfast meal. It can also be served at lunch or as canapés. For those who dislike the idea of using raw fish when it comes to making sushi, smoked salmon is a better alternative. It has also been found that traditionally, the roll uses smoked salmon. Another plus to making Philadelphia maki at home is that for those who do not know how to make use of chopsticks or consider it a chore, it can be eaten with your hands. In fact, sushi rolls are often eaten by many in Japan with their hands. What’s in a Philly Roll? A lot goes into the preparation of a Philly roll. The traditional filling in a Philly roll is fish (in this case, smoked salmon), sushi rice and cucumber and cheese cream. Not just any cream mind you but Philadelphia’s for therein the difference lies. 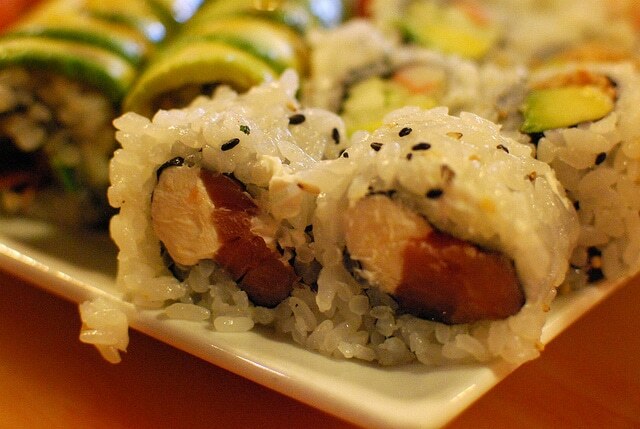 Flavorful sushi, the use of seasoned rice vinegar is advised. This is different from regular rice vinegar as it has an added ingredient of sugar, sometimes corn syrup, and salt. But if you happen to have just regular white vinegar in the pantry, improvising is allowed. Make sure you use polished (white) short-grain Japanese rice (japonica) or medium grain California. They are often labeled as sushi rice sold at stores in the US. Sushi rice is a bit different from plain white rice. Sushi rice which is white, short grain rice has a higher level of starch which makes it stickier. It is cooked in a 1:1 ratio of water to rice and seasoned with a vinegar solution. The seasoning has to be added to the rice a little at a time to enable even distribution. A bamboo paddle or wooden spatula would aid in this. After seasoning, a damp cloth is placed over the bowl of rice and stored at cool room temperature until you’re ready to use it. This will stay for 12 hours and be careful not to refrigerate or freeze it as this will destroy its texture. 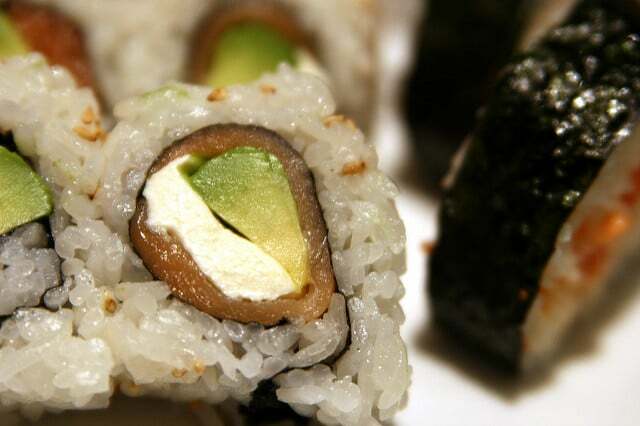 In making salmon cream sushi roll, some chefs incorporate avocado. With avocado in the mix, you have a healthy dose of protein and fats. However, to keep your sushi dinner healthy, you need to exercise portion control. The idea of using avocado in sushi was birthed by a certain Japanese chef in Los Angeles about 40 years ago who used avocado as a replacement for toro because it offered almost the same “melty mouth feel’. With a mild flavor and pleasant fattiness packed with healthy omega- 3 fatty acids which are not too oily or too rich, smoked salmon sushi has become a favorite for many around the world. There are many that do not like sushi with raw fish as they have feared it may not be safe to eat fish that’s been sitting in the freezer. This can be solved by alternating with smoked salmon in smoked salmon sushi. Smoked salmon is not raw as it has been cured just liked salami. So it can be eaten without additional cooking. It can even be preserved in the freezer for use later. 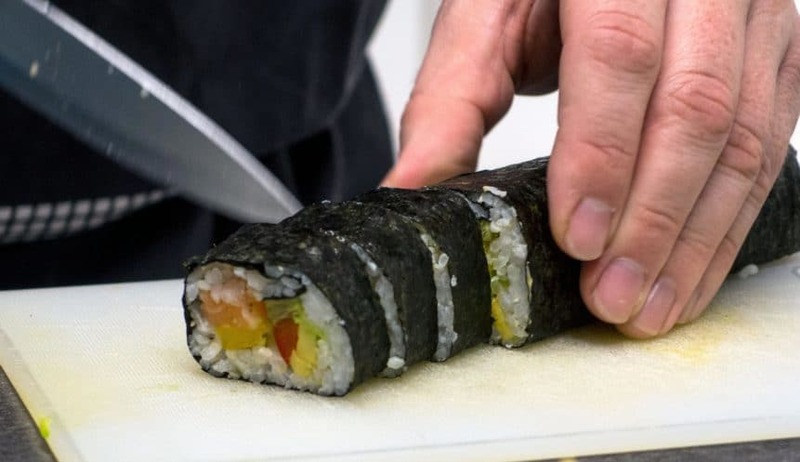 In all, when it comes to making sushi Philly rolls, care should be taken not to overload with ingredients because then, it would be difficult to seal and they might burst when you attempt to cut them. Though in Japan, chefs have to go through at least 10 years of training to become a sushi master, that doesn’t mean you can’t make sushi Philly roll at home and even become a maki master while at it. Making it at home can be a lot of fun amidst being easy to make. All you need is a little patience and a sharp knife. Yeah, this is not a meal where you rush through the preparation. Why this much emphasis on a sharp knife you may ask. A dull knife is a big no as you’re likely to injure yourself and ruin your roll when it comes to cutting it. When it comes to preparation, the following ingredients are needed. First of all, you have to prepare the sushi rice. Put rice in a bowl and fill with fresh cold water, you will notice that the water becomes cloudy. Wash rice to get rid of the starchy power that is attached to the grains. Use your hand to swish and stir the water and drain using a fine mesh strainer. Repeat the process until the water is clear. Boil; reduce to a simmer and cover. Cook for about 15 minutes just when all the water has been adsorbed stirring at intervals to prevent sticking. A better alternative is to make use of a rice cooker. Pour a small amount of the seasoned rice vinegar evenly over the rice a little at a time. Toss the rice gently with the aid of a spatula or paddle lifting and turning it over. This is to ensure optimum distribution of the seasoned rice vinegar. Fan the rice; you can add the vinegar to the rice tasting it regularly to know if you’ve got your desired taste. Cover seasoned the rice with a damp cloth until ready for use. Now, that you’ve prepared your delicious sushi rice set out to prepare the rolls. 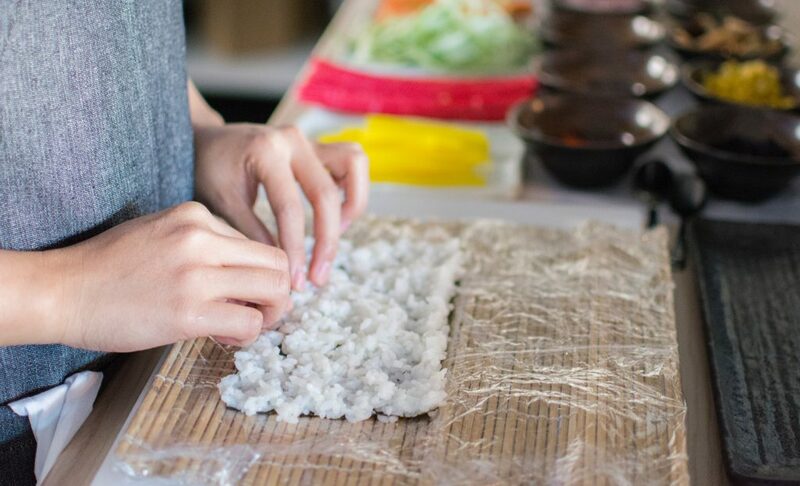 With all the ingredients ready, lay a full nori sheet on a bamboo mat. Take a cup of sushi rice and place it on the left edge of the norm. Spread the rice evenly over the entire sheet from left to right using your hands. Take extra care, not to mash the rice so keep a light touch as much as possible. In the center, spread a roll of cream cheese strips. Next, place a row of salmon to the far end and then, lay a row of slivered cucumber on the side of the cream cheese closest to you. Roll the mat away from you by putting your thumbs under the mat. 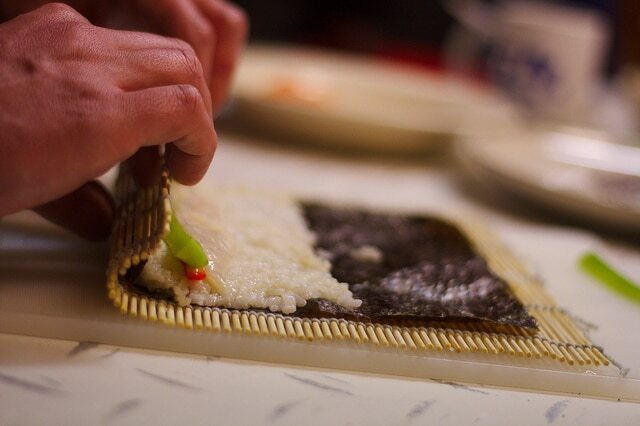 While lifting up, use your hands to also curl the nori and the rice around the filling. With a gentle squeeze, continue rolling until the outer edges are sealed. Once you’re done with this, gently press the right and left the side of the roll to neatly secure the ingredients inside. To cut the roll, transfer it from the mat to a board. Dip the tip of the knife into a bowl of water, let the water run down the length of the blade to dampen the knife. Slice the roll swiftly in the middle to divide the make into two pieces. Take the two pieces and place them side by side. Slice in the center again. This will give a total of eight pieces. the less action you make when slicing, the better. Your Philly roll is ready to serve. You can serve with wasabi. Ensure you never use a dry knife when slicing the rolls. This will cause the rice to stick and the roll will fall apart. Making sushi at home is fun and allows you to be creative. A number of ingredients can be added such as sesame seeds or avocado but avoid using too many ingredients if not it will be harder to roll. Like I said earlier on, when spreading the rice, avoid a heavy hand, a thin layer will do just fine. Fanning the sushi rice while preparing gives room for quick cooling. This gelatinizes the surface and gives a glossy look to the rice. When you want to mix the seasoned vinegar with the cooked rice, it is better to do so in a sushi-oke or an unvarnished wooden bowl. A ceramic bowl or wide shallow glass can also be used but not an aluminum bowl as this will retain heat differently and add a metallic taste to the rice. Philly rolls aren’t just restricted to wasabi; they can also be served with short, green onions, ginger. The rolls can also be sprinkled with toasted sesame seeds. A dip in soy sauce or Sriracha chili sauce just crowns this meal for me. On a not so busy day, put this recipe to a test and indulge your taste buds in a Japanese cuisine right at home.